Around 1900 electric light and heating was installed. 2. to 7. August 1911: The 250th church anniversary was celebrated as a big local celebration which was organised by the minister Lothar Koch and local poet Arno Schlothauer. 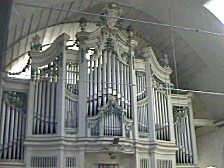 The church was given its fifth organ, a Jehmlich organ from Dresden which cost nearly 20.000 Marks and was paid by entirely with donations. 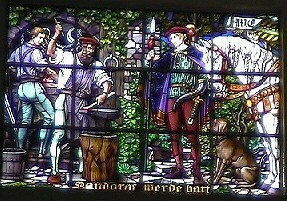 The archduke donated the stained glass window with a scene entitled "Landgraf werde hart" from the legend "Der Schmied von Ruhla" ("Smith of Ruhla"). 1934: Renewal of the rendering. 1938: Installation of pulpit figures and new electric lights, painting of the inside walls. 23/24 September 1961: The 300th church anniversary is celebrated with social evenings, services and a concert. 1983 to 1988: Extended restorations: The western wing is no longer needed and is separated from the altar space and the southern wing by a glass wall. The re-opening is celebrated at the beginning of a period of ten days of festivities on May 8th, 1988. Summer 1992: Installation of lamps at the steps of the church. Spring 1994: Renewal of a part of the steps. 1995 to 1996: Renewal of the spire that was threatening to collapse. The half timbered inside as well as the very top of the tower was completely renewed and the roof was tiled. 1997: A crack in the middle bell was detected. The cost of a new bell was estimated at about 30.000 Marks. 11 September 1998: The new bell, paid for entirely by donations (! ), was cast in Lauchhammer (Lausitz). 9 November 1998: Arrival of the new bell in Ruhla. November 1998: Consecration of the bell by the bishop of Thuringia in presence of the minister-president of Thuringia, Dr. Bernhard Vogel. June/July 1999: Outside renovating of the ministers house. July 1999: Festive service as part of the Landestrachtenfest on the Kurhausplatz in Ruhla. (08 July - 11 July 1999). Summer 1999: The conversion of the Western Wing to a church hall, including the renovation of the floor, the installation of a blow heating system in both wings and sanitary installations, is completed. The opening was celebrated on August 1st. Summer 2000: Renovation of the roof of the Southern Wing. 21 January 2001: A service is broadcasted on the radiostation MDR-Kultur. Winter 2001/2002: The restoration-works on the churches insides (including a complete renewal and gilding of the font, all paid for by donations), made necessary because of the renovation of the roof, and the repair of the organ are finished. Summer 2002: Partial renovation of the graveyard wall - to be continued. Winter 2003: Renovation of the roof of the Western Wing. 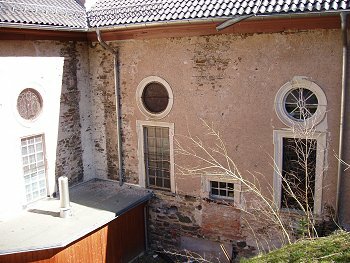 Further restoration work of the outer south and west wall of the church is necessary!